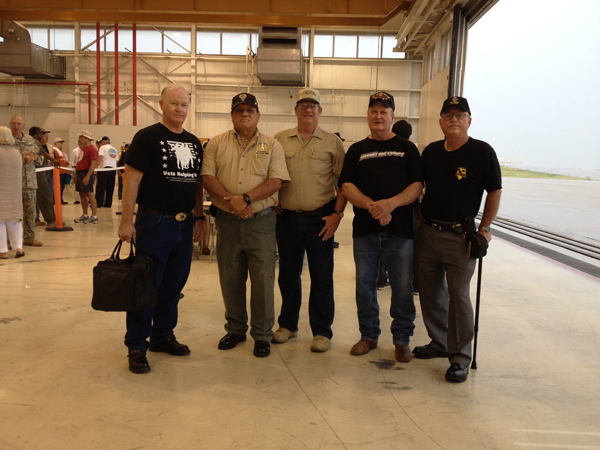 Four of our own, Dennis Smith, Juan Gonzales, Harry Morton, "TC" John Wiley, and Jerry Caballero all waiting to board the Huey. Here is the story from the Killeen Paper. Richard Dipboye and his wife, also PGR members were there too. I met Major Sweeney and found out he served with the same unit that adopted me. He was there with the 5th Bn/ 7th Cav 1st Cavalry Division when the Cav went into Cambodia in 1970. Yesterday was a very memorable day. Myself and several other PGR members, along with many other Veterans and Active Duty Military personnel attended the "Last Ever Military Airlift conducted with UH-1 Huey Helicopters". The last three active Huey's in the Army's inventory were retired. It was a bittersweet ceremony and in several ways a lot like a PGR Mission. It was a sad day because of the event that brought us to Grey Army Airfield, but it was a tremendous honor to be there and participate in the Airlift and Ceremony. As with a PGR Mission, the day is filled with sadness and memories but at the end of the day when you have had a chance to unwind a little and reflect back, you feel really, really good about what you did that day. Juan, Harry and I were all lucky enough to get on the same flight. We were on the second chopper in the very first sortie of the day. Her tail number was 0-21554 and was piloted by Col. Neal Hersey. Although we had never seen her before yesterday, I know that she will be a sweet Memory to all of us from now on. The other two choppers retired were tail numbers 0-16277 and 4-22495. Ladies Thank You and Rest in Peace. You have served your Country well. We are each just a pixel in the "Big Picture." Together we bring it into focus. Hopefully the image we create will leave a positive and lasting impression on each Family and Community that we have the Honor of serving..
What an honor to get to take part in such an historical mission. But to be able to take part with men of such caliber, I'm almost overwhelmed. It had been a long time since I'd ridden in one of these old war horses. For my last ride to be with men like Juan Gonzales and John Wiley it will mark a day I'll always remember. Many thanks to the 21st Cavalry Brigade for making this flight possible. I'm also thankful for the friendship of these fellow passengers who made this last flight even more special by their presence and their patriotism. Great picture of some of Americ's best. Thanx each of you. For the first time in my life I had an honest to God, wide awake, flash back. Thank you 21st Cav! And thank you Juan, Gerry, Harry, Richard, John and all the others that made this a once in a life time ride. You can never go home but you can go to that place in your heart where you hold it. Well deserved ride for these fine men.